Now that the draft process is complete, I will do a series of articles discussing the draft picks of each team by division. Each week I will be analyzing a different division. Since these players have yet to set foot on an NFL field, I don’t do draft grades. I don’t believe a draft should be graded for at least two years, which gives players some time to develop. 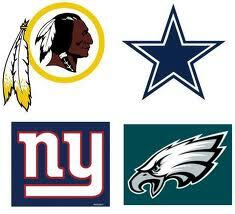 Today I begin to look at the NFC and start with the NFC East. I have to give the Cowboys a ton of credit. I never would have thought that Jerry Jones would have been able to resist drafting Johnny Manziel. Jerry normally likes glitzy players and the marriage of Manziel and Jones seemed to be inevitable. Jones to his credit, resisted the temptation and the Cowboys made a solid pick in Zack Martin. They probably wanted a defensive lineman, but Aaron Donald and Anthony Barr were already off the board. Personally, I would have taken Calvin Pryor to give them a big hitter at safety (how long have the Cowboys needed a safety), however, I can certainly understand the thinking behind the pick of Martin. They paid a boat load of money to Tony Romo and they need to keep him healthy. Martin has a rare ability to play all five offensive line positions. Look for him to be given a shot at right tackle. If he doesn’t play well there, they can always kick him inside to guard. When round 2 came around, the Cowboys had to have a pass rusher. After losing DeMarcus Ware and Jason Hatcher to free agency, the need at defensive end was huge. Lawrence is a versatile player that lined up inside and outside for the Broncos. He only weighs 251 lbs, so he may need to get bigger and stronger, but the athleticism is definitely there. The team did not have a third rounder, but I believe they got good value in the next two picks. Anthony Hitchens played on the outside for the Hawkeyes, but with the Shawn Lee injury he may get a chance to play in the middle. He has the size to play inside if they determine they need him there. Devin Street was a very solid pick in the 5th round. I had him going no later than the 3rd round. He doesn’t have blazing speed, but has good size and has the ability to make tough catches. The Cowboys didn’t have a 6th round pick, but made several selections in the 7th. Ben Gardner is a guy that I thought would be a better 3-4 defensive end, but he could also be a good fit as the left defensive end in a 4-3 alignment. He’s probably not a guy that’s going to produce many sacks, but he should be a good run stuffer with the ability to also play inside in nickel situations. Will Smith is a linebacker that runs well. He can drop into coverage and makes plays sideline to sideline. If he is to make the team, he will have to do that on special teams and also possibly getting some snaps in nickel situations. Ken Bishop is a player that can tie up blockers and make plays against the run. He doesn’t have great size and isn’t great at rushing the passer. I like the Ahmad Dixon pick. He is better when he plays in the box and at times can be a liability in coverage, however, he is a good value in the 7th round. Terrance Mitchell played in the shadow of Ifo Ekpre-Olomu at Oregon. He has good size and is a fluid player. Mitchell is better when he is allowed to play in off coverage. It looks strange seeing the Giants pick a skill position in the 1st round. They are known for taking blue collar players early. The Giants needed to give Eli Manning a weapon and Beckham is a guy that can stretch the field. He should be able to get on the field fairly early in 3 or 4 receiver sets. He is also an excellent return man that can change field position. Weston Richburg was my highest rated center and he will be given a chance to be the day one starter. Eli Manning took a lot of hits last year and Richburg should be able to cut down on the inside penetration and hopefully cut down on some of those hits. Jay Bromley will give the Giants depth on the interior. He is a good run stuffer, but may not get a lot of snaps on passing downs. Andre Williams is a typical Giant running back. He is a very strong and powerful inside runner. He has giant calves and his nickname is “Little Earl” because he has a similar body style to former NFL great Earl Campbell. Williams is a workhorse that carried the ball 355 times last year for almost 2,200 yards. He struggles to catch the ball so he will need work in that area if he wants to be on the field on 3rd down. Nat Behre doesn’t have great size or speed, but he flies to the ball. He should be a good special teamer that may get some work in special packages. Devon Kennard has good size and decent, but not great speed. He has NFL bloodlines (his dad Derek was an offensive lineman for the Cardinals, Saints and Cowboys). Kennard showed good versatility playing both outside and inside linebacker and also defensive end for the Trojans. He will likely be a backup linebacker on the strong side. Bennett Jackson is a former wide receiver that played the last three years as a corner. He is an excellent special teamer that should be able to make the team and contribute in that area. The Eagles made a surprising move by drafting Marcus Smith with the 26th pick in the draft. Not many people had him ranked this high, but I like the pick. Smith had 14 ½ sacks, just ½ sack behind Trent Murphy, who led the nation. The big concern is that he is a one year wonder, never having more than 5 ½ sacks in any previous year. Trent Cole will turn 32 this year, so Smith is likely the heir apparent at his position. I really like Jordan Matthews. He is the career leader in the SEC in receptions and receiving yards. He’s also the cousin of NFL Hall of Famer Jerry Rice. He has very good size, long arms and is willing to go over the middle and take the tough hits. Matthews has deceptive speed. He ran a 4.46 40 yard dash at the Combine and has a knack for getting deep. Many people thought Coach Chip Kelly would pick players he was familiar with in his first year with the Eagles, but that did not happen. 2014 was a different story, though with two former Oregon players picked. Josh Huff is a receiver with the body type of a running back. He doesn’t have great speed, but he is a versatile player that can play in the slot or outside. He is also a willing blocker, which will earn him brownie points with the coaching staff. Jaylen Watkins is the brother of former Clemson receiver Sammy Watkins, who was drafted 4th overall by the Buffalo Bills. He has played both corner and safety and has the ability to cover slot receivers. Watkins has a good combination of size, strength and speed. He is a very athletic player that should have no problem contributing in 2014. Taylor Hart was the second Oregon player picked by the Eagles. He has the prototypical body type of a 3-4 defensive end (6’6” 280 lbs.). The Eagles have several fairly young defensive ends, so he may have time to develop. Ed Reynolds is a safety that excels in playing center field. He had a better 2012 season than 2013. In 2012 he led the country with 3 pick sixes and his 301 return yards is the second highest total in NCAA history. Beau Allen is the prototypical nose tackle. He is not very athletic, but he can sure tie up the middle of the line. He may have trouble making the 53 man squad and looks like he could be a candidate for the practice squad. For the second year in a row, the Redskins did not have a 1st round pick due to the RGIII trade. Murphy led the country in sacks and joins Ryan Kerrigan and Brian Orakpo at the outside linebacker position. Orakpo was paid $11.455 million for this year as their franchise player. If he does not produce, it’s possible they could release him and plug Murphy into his spot after this year. For 2014, the pick of Murphy gives the Redskins versatility and depth at the linebacker position. Morgan Moses is a massive tackle with long arms. He gives the Redskins good depth and could possibly push for playing time late in the year. Spencer Long is a blue collar player with a nasty streak and a competitive nature. He is a very strong player that excels in run blocking, but also holds his own in pass protection. Bashaud Breeland isn’t very big or extremely fast, but he has good footwork and technique. He plays with passion and is very competitive. He plays with passion and doesn’t shy away from contact. I really like Ryan Grant and I believe he is a great value getting him in the 5th round. Grant has excellent hands and very good body control. The one red flag is that he doesn’t have great speed and may have trouble gaining separation at the next level. Speaking of speed, I was surprised at the 40 yard dash numbers for Lache Seastrunk. He only ran a 4.51 40 at the Combine and improved the time to 4.46 at his pro day. He looks much faster when he plays. Seastrunk has nifty feet that allow him to find creases quickly and accelerate through them. He will have lots of competition with Alfred Morris, Roy Helu already on the roster. Ted Bolser is a big target that lacks speed. He may have a hard time making the roster with Jordan Reed, Niles Paul and Logan Paulsen already on the roster. It’s hard for me to get excited about drafting a kicker, but Zach Hocker has a good chance at making the club. His primary competition is Kai Forbath. Next Wednesday, I will be posting my analysis on the NFC North. If you like what you read, please like us on Facebook and recommend us to your friends. This entry was posted on June 11, 2014 by draftmaniacs in Draft Analysis and tagged 2014 NFL draft, Dallas Cowboys draft, New York Giants draft, NFC East, NFL, NFL Draft, Philadelphia Eagles draft, Washington Redskins draft.